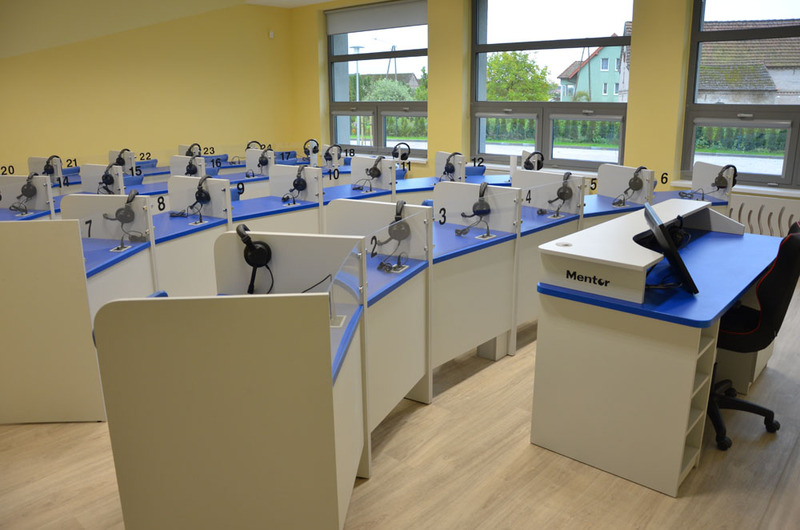 Only Mentor's language laboratories are the right choice! 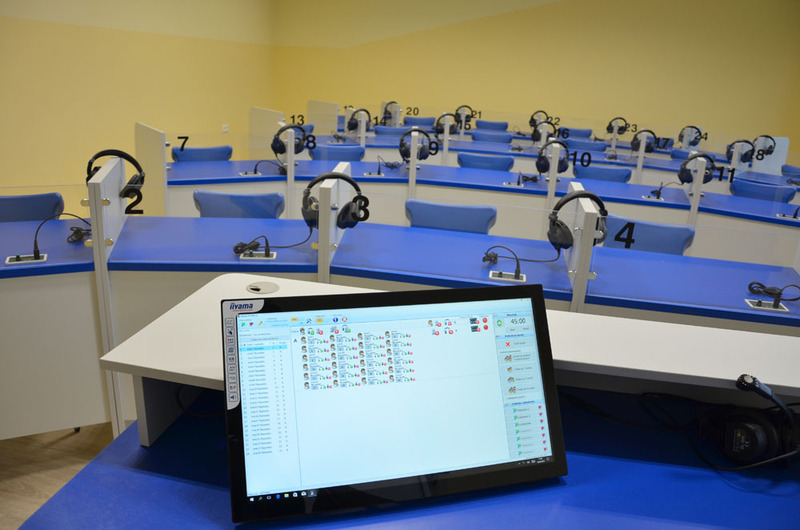 Effective forms of classes, exercises and interactions used by language instructors for years were implemented by our company in an electronic language laboratory. 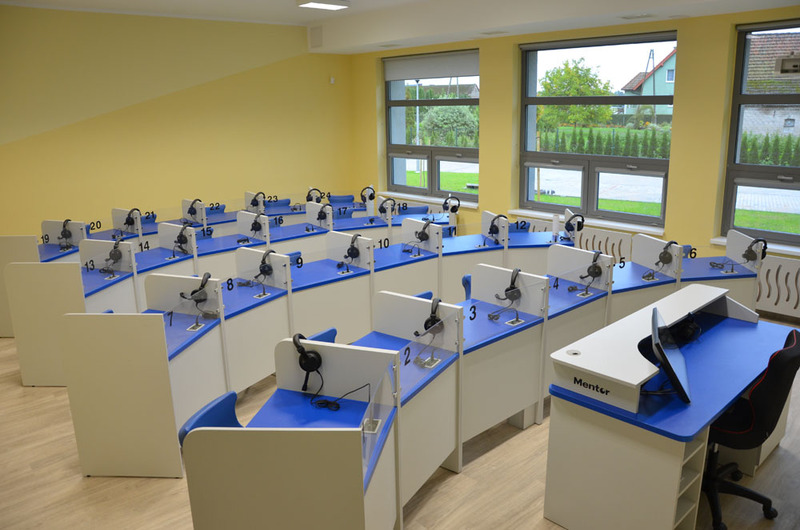 This excellent tool's features are based on experiences and work methods of professional language instructors - that's why Mentor's language laboratories are well-known and valued all over the country. 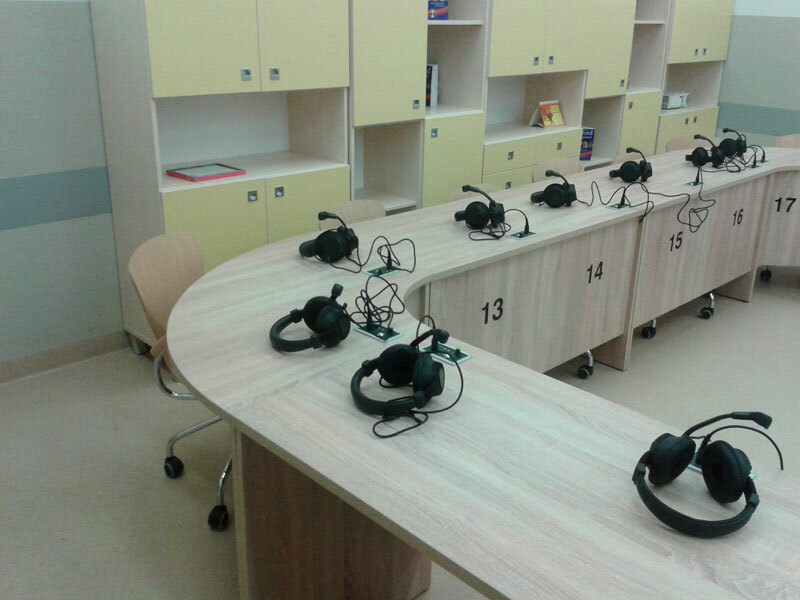 A language laboratory is an invaluable solution to the problem of teaching a language a numerous group of students. It helps students to concentrate and forces them to focus on the task at hand. It enables loud pronunciation training through casual dialogue. The training improves one's diction and overcomes the natural struggle to speak in a foreign language. 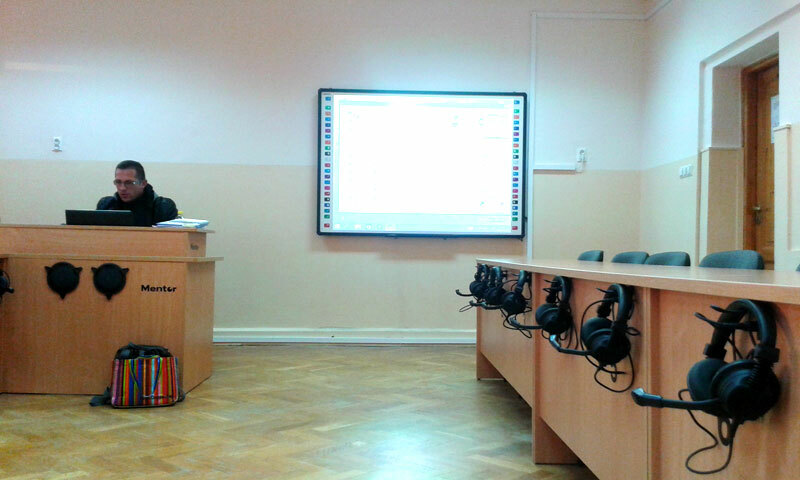 Employing hi-tech devices works as encouragement for students - attractive classes are easier to profit from. 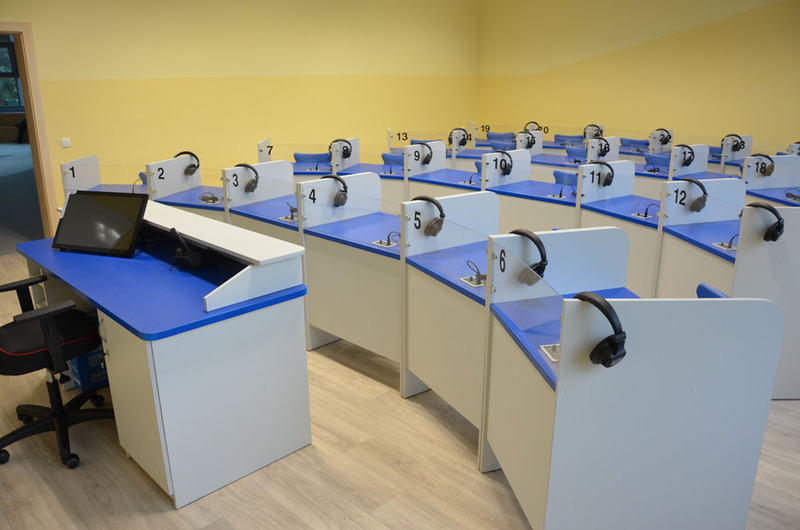 Compared to traditional teaching methods, using the language laboratories greatly increases the learning efficiency of students. 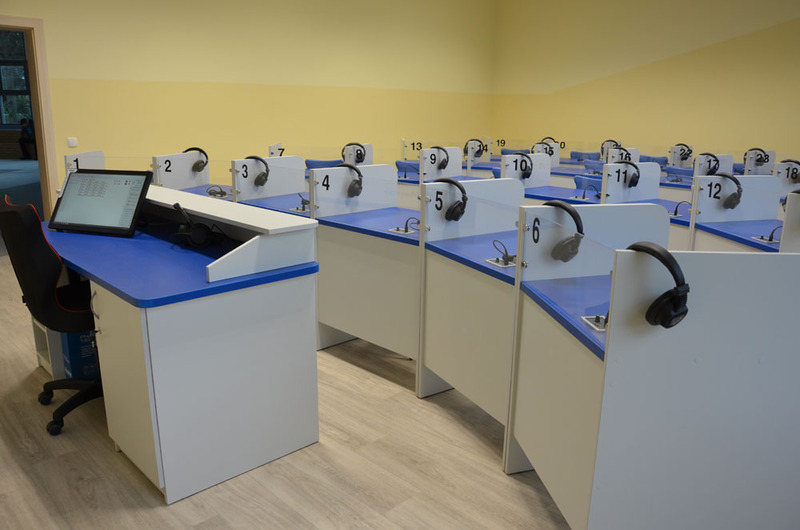 Our language laboratories are a guarantee of functionality, quality and durability. 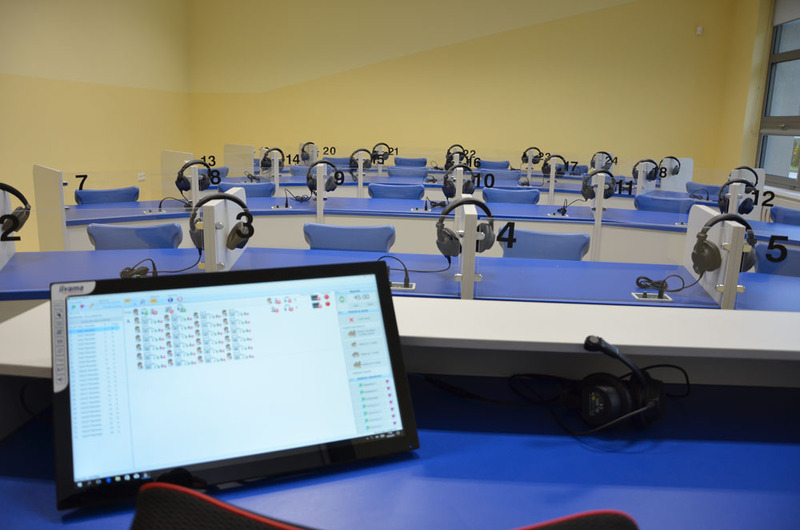 Why is a language laboratory worth using? Two minutes. Two minutes is time a teacher can afford to spend on a single student during a class. 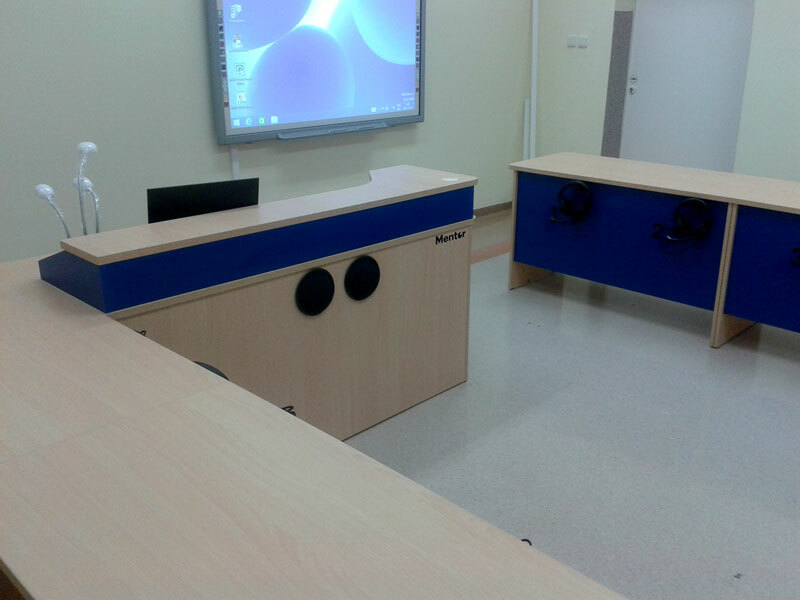 Traditional teaching based on a lecture and exercises during a 45 minutes class is what most schools offer. 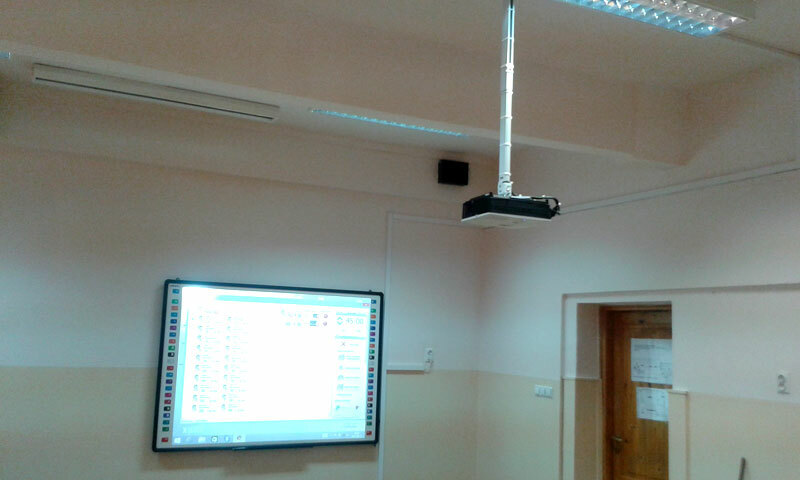 It's very common for a teacher's job to be limited only to replaying an audio material, explaining some problem and running a few group exercises. All students are doing exactly the same, single thing at a time. Will everyone understand everything? Is a perception of each student comparable? Will the quantity of repetitions be enough for everyone? 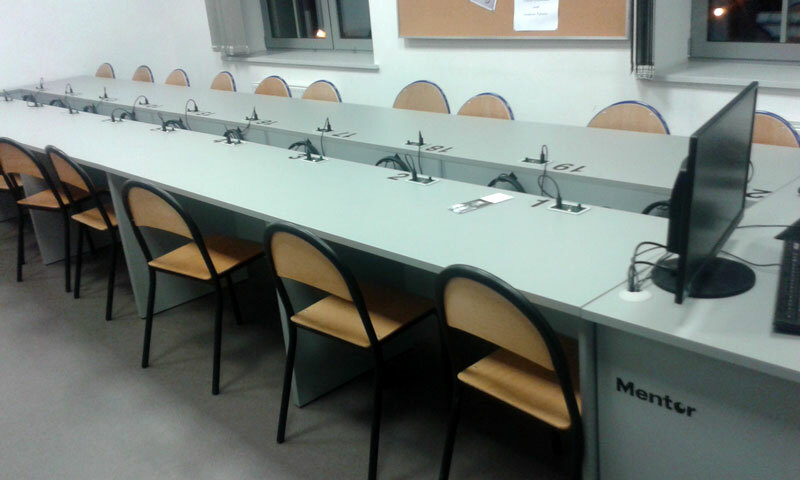 Lack of time for individualisation during a class is a serious issue. 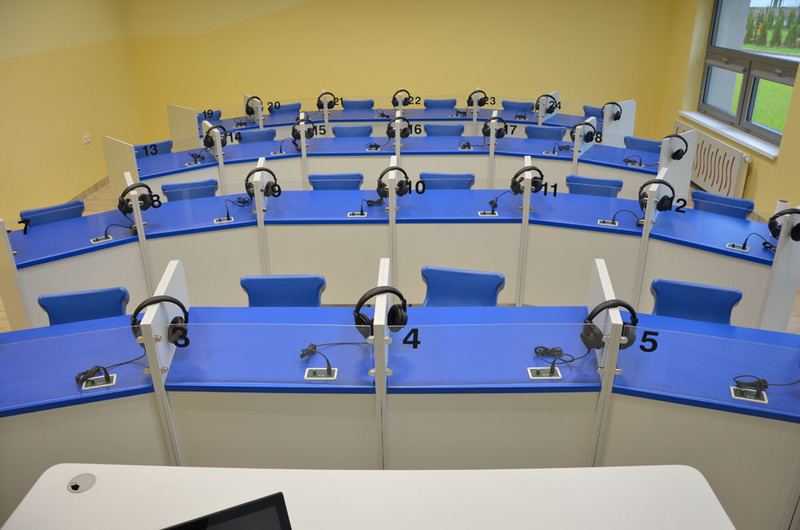 A language laboratory addresses and solves the problem. 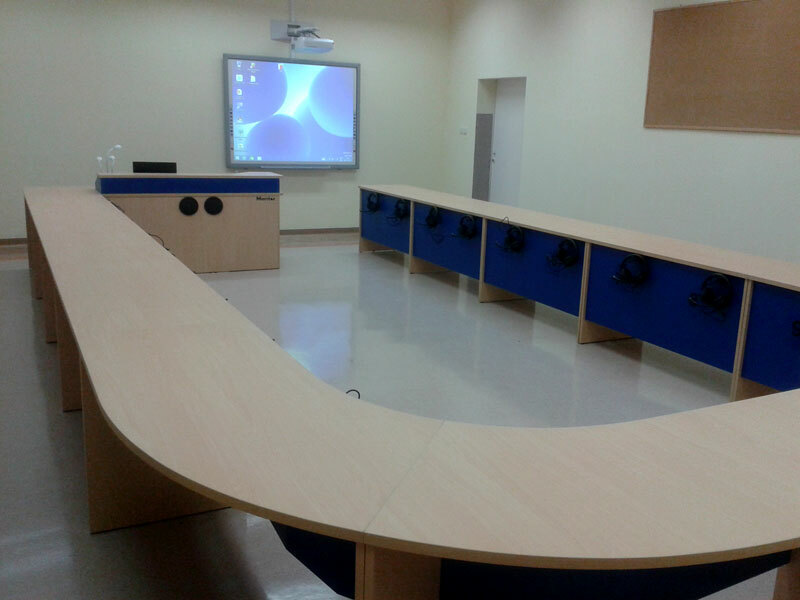 It's a complete solution to conduct attractive and engaging classes. 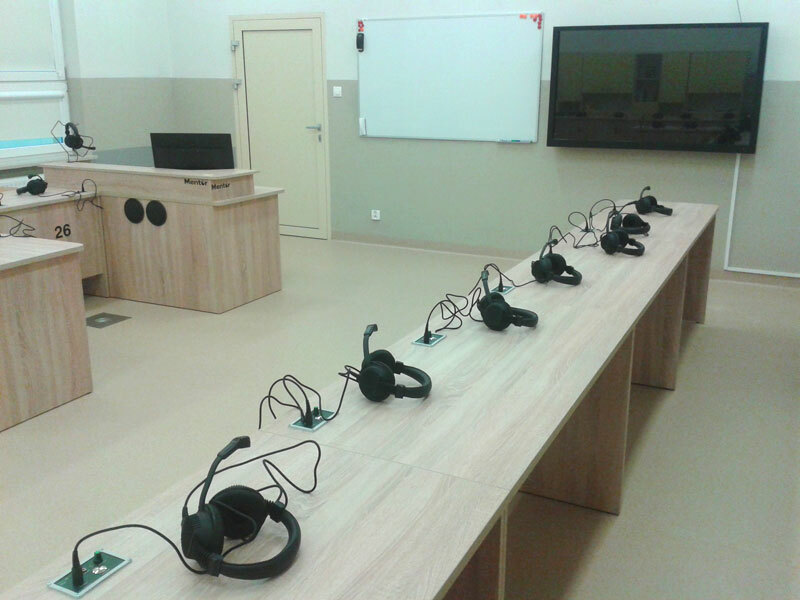 A language laboratory is an invaluable solution to the problem of teaching a language a numerous group of students. 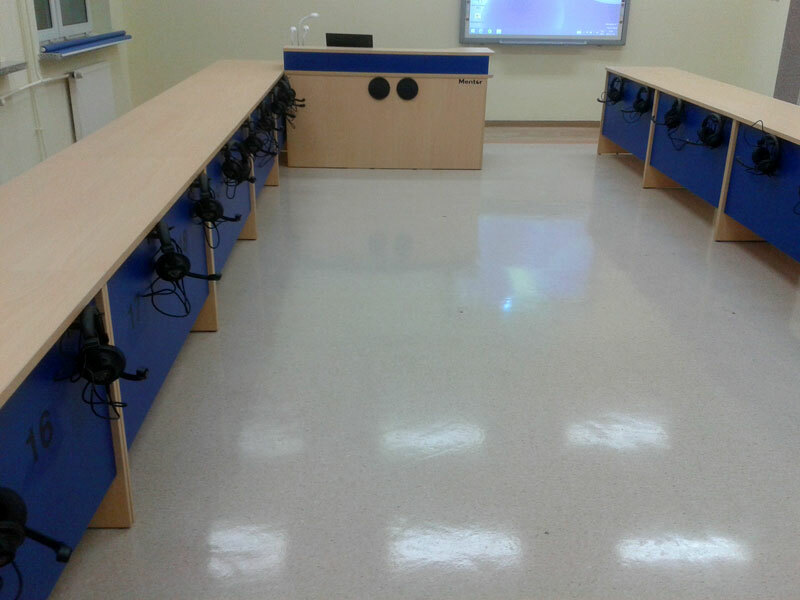 It helps students to concentrate and forces them to focus on the task at hand. It enables loud pronunciation training through casual dialogue. The training improves one's diction and overcomes the natural struggle to speak in a foreign language. 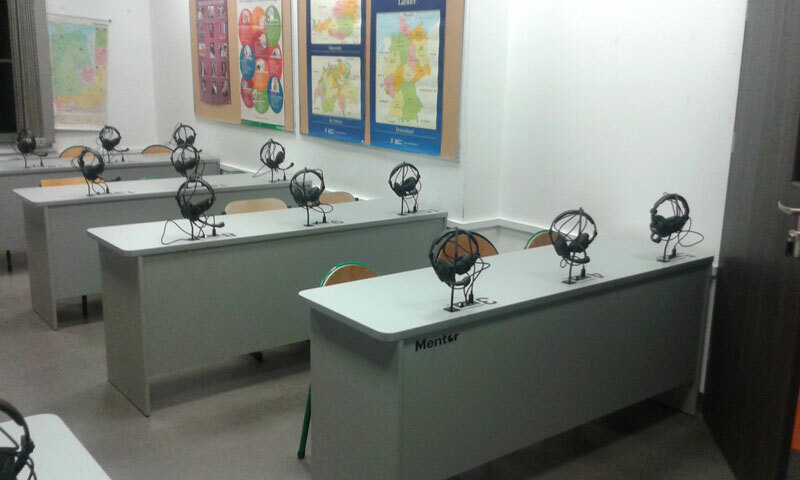 Employing hi-tech devices works as encouragement for students - attractive classes are easier to profit from. 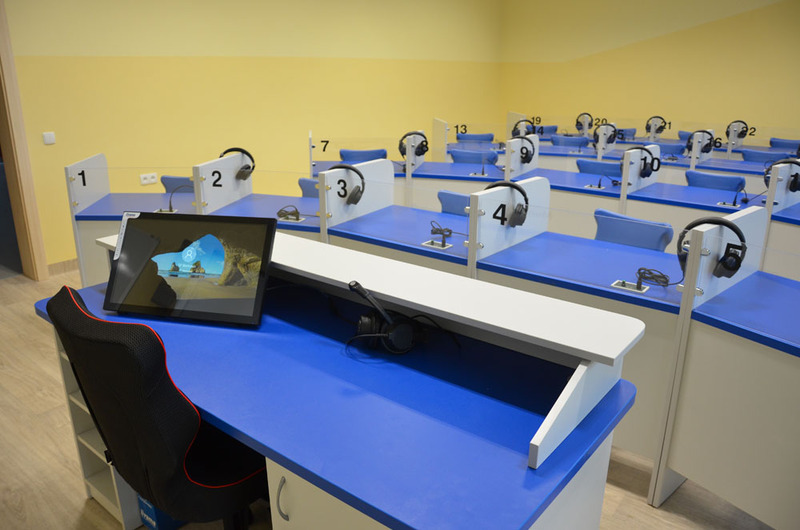 Compared to traditional teaching methods, using the language laboratories greatly increases the learning efficiency of students. 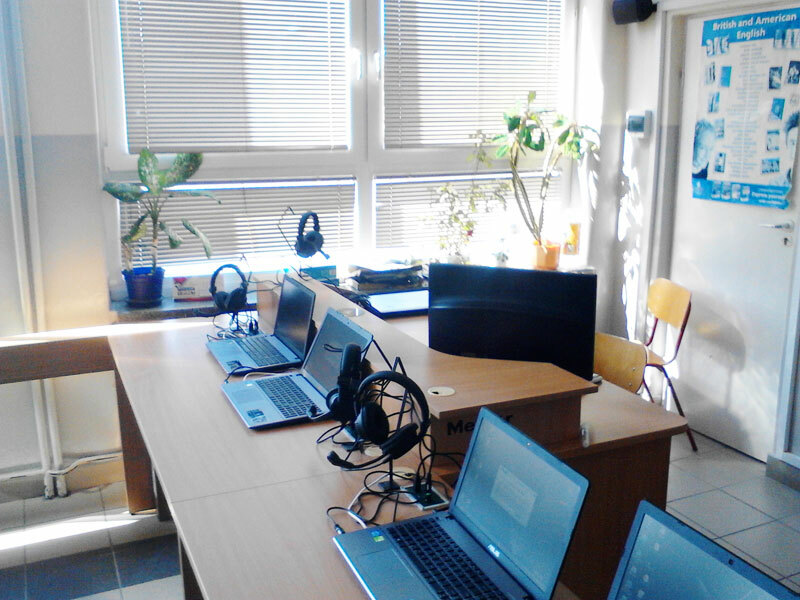 What a language laboratory offers? 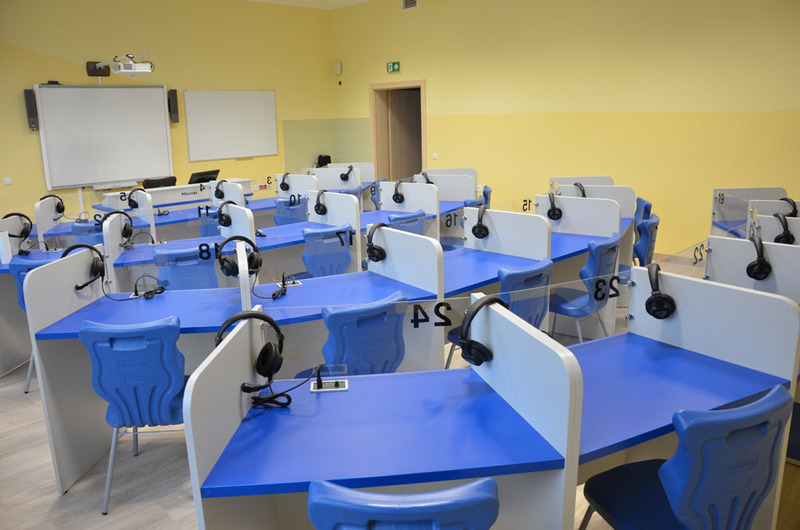 Simultaneous individual work - all students can loudly—and at the same time—repeat a course material without disturbing their classmates and without being disturbed by them. 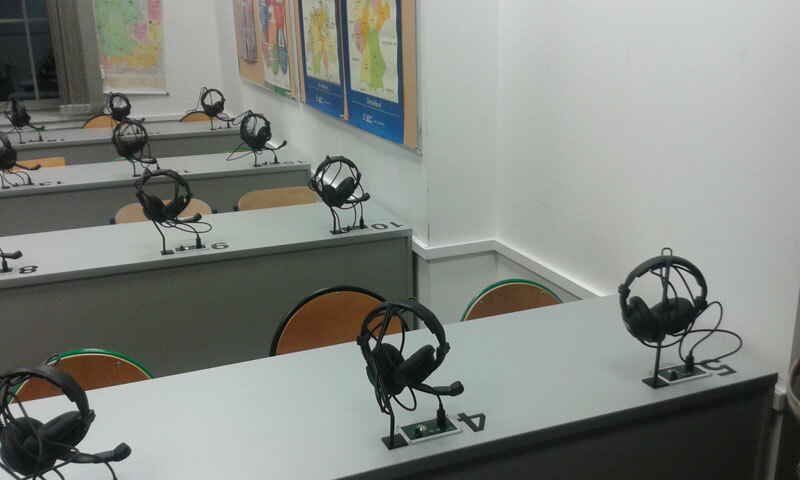 very student can practice pronunciation at the same time, throughout a class - it maximises the usage of time. 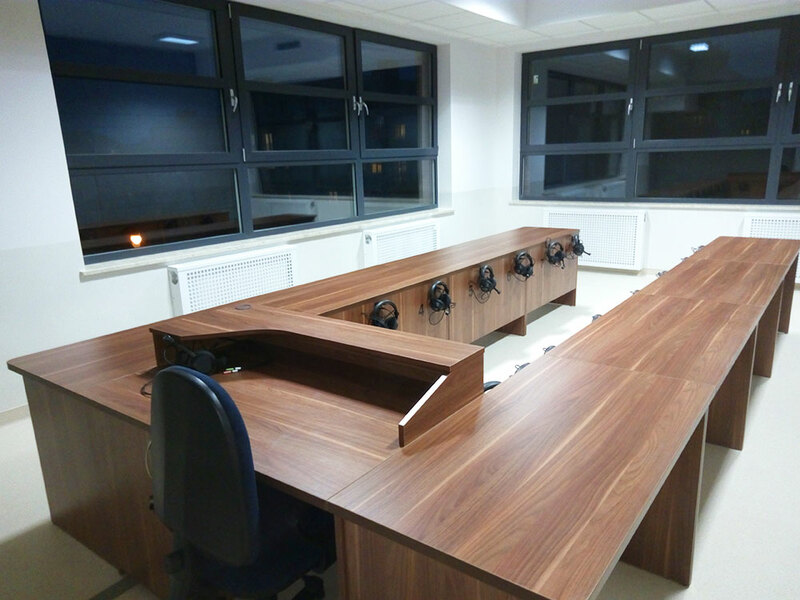 It can be achieved thanks to utilizing professional headsets which absorbs surrounding noise. Working in pairs and groups - a teacher conducts exercises on paired or grouped students. Students paired or grouped together will only hear each other and not the other pairs'—or the second group's—members. Talking paired with a friend throughout whole classes will add up to many hours of speaking the language. 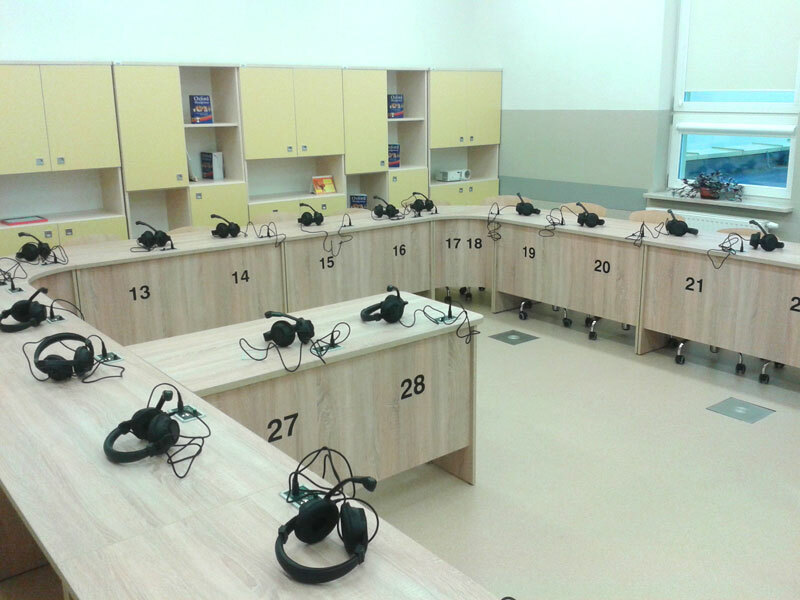 Audio monitoring - a teacher has a possibility to eavesdrop on students' conversations in each work mode (pairs, groups). 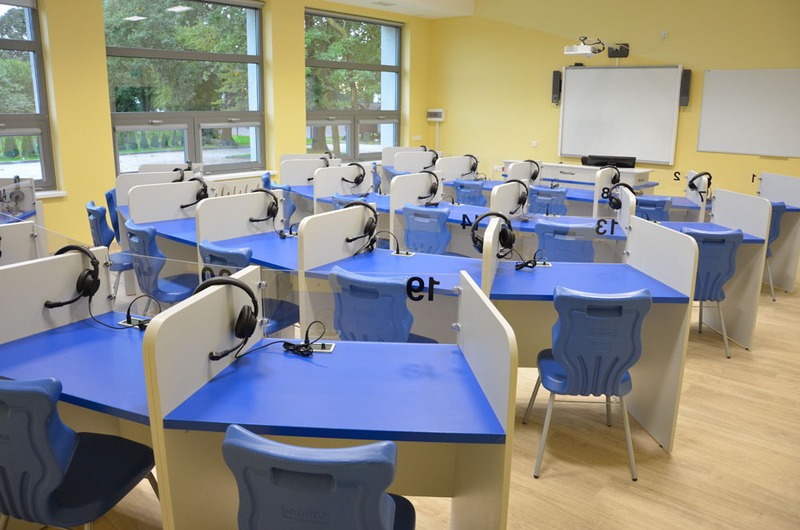 Audio monitoring feature allows a teacher to keep track of a correctness and a progress of students' task at hand. An additional, important trait of the feature is a self-correction of students. 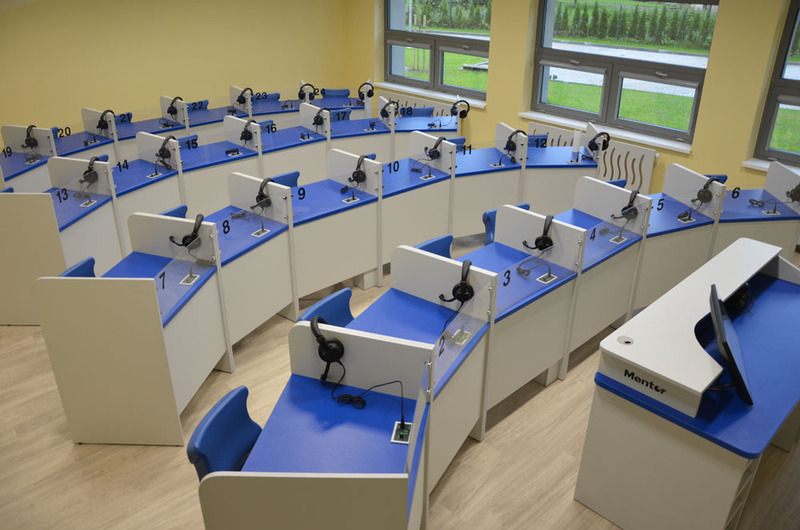 Students don't know when a teacher is listening in to them and that motivates them to attain focus and carefulness during exercises, causing them to absorb more material. Correcting mistakes - a teacher can join a discussion and correct any mistakes he or she notices as simply monitoring a discussion is often not enough. 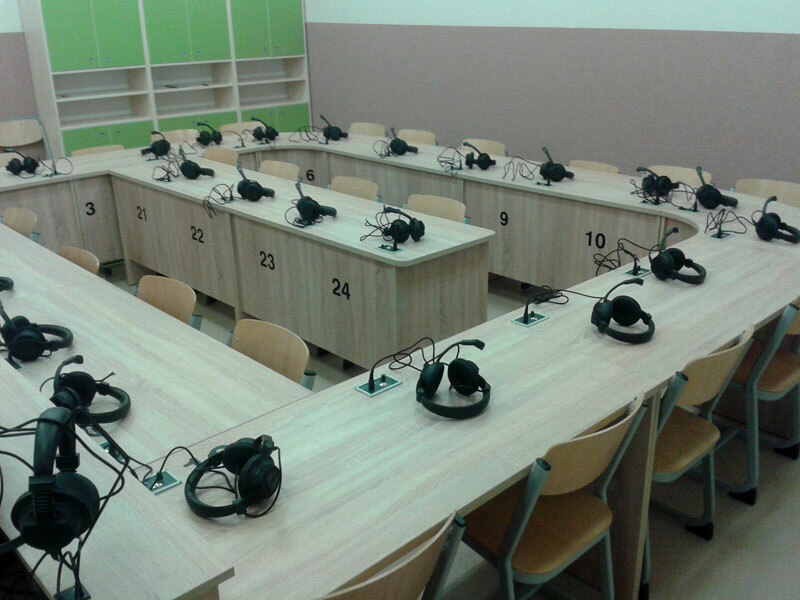 It's a essential feature for such a individual method of learning a language laboratory is based on. 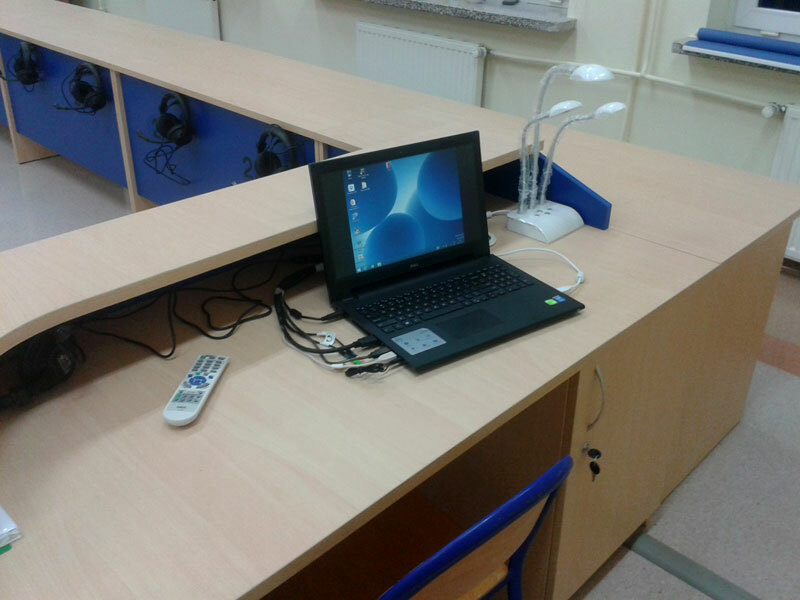 External devices - making use of possibilities which audiovisual devices provide together with a language laboratory, increases innovativeness of conducted classes significantly. 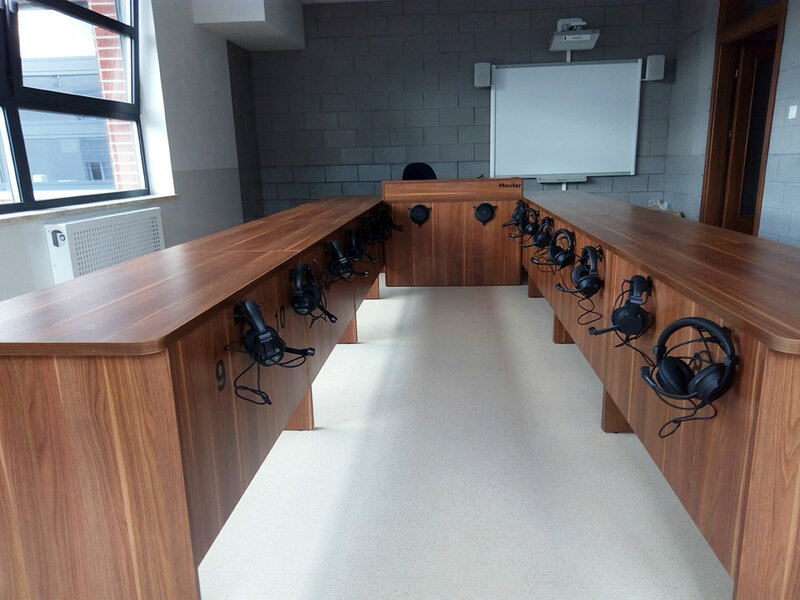 The laboratory can work with a tape recorder, a CD/DVD player, audio recorder, PC, television tuner and an interactive whiteboard. 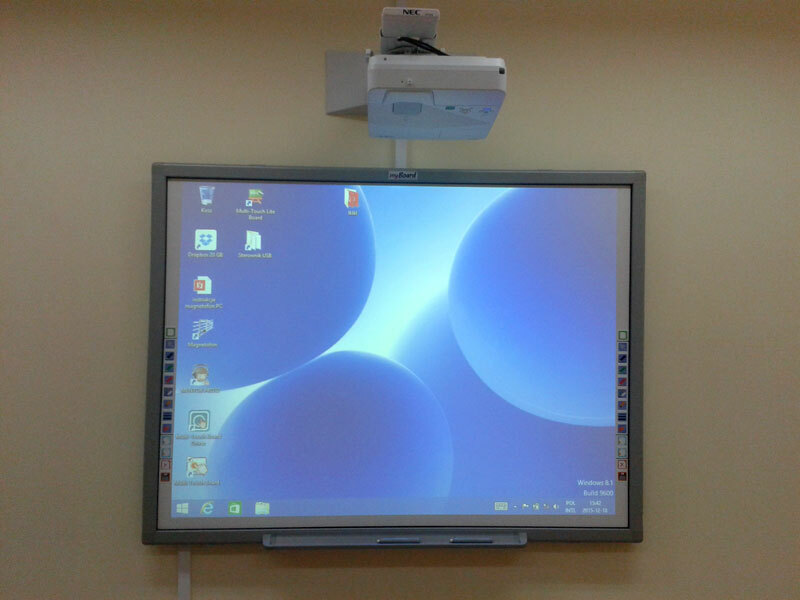 Learning with hi-tech devices is more appealing and encouraging. 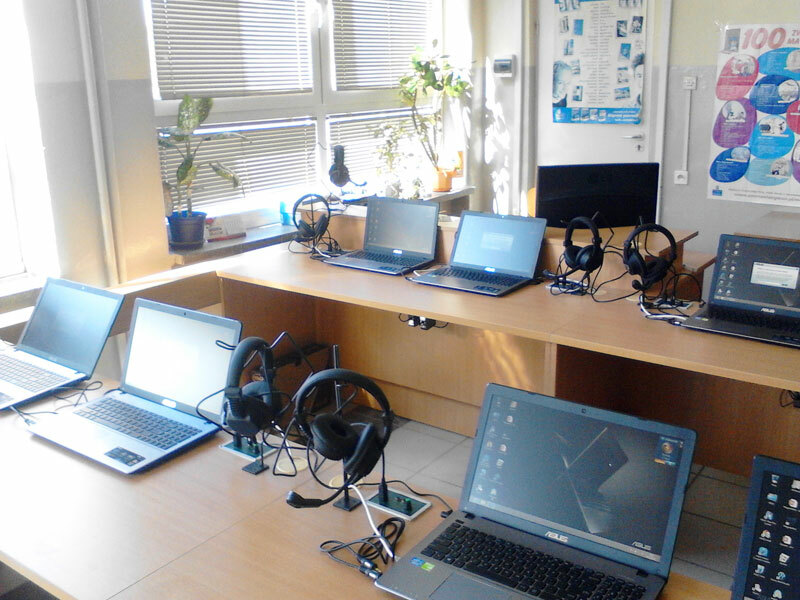 Language software increases a factual level of conducted classes by providing diverse, professional material. Carefully chosen applications preoccupy students with a class, motivating them to a future self-improvement. 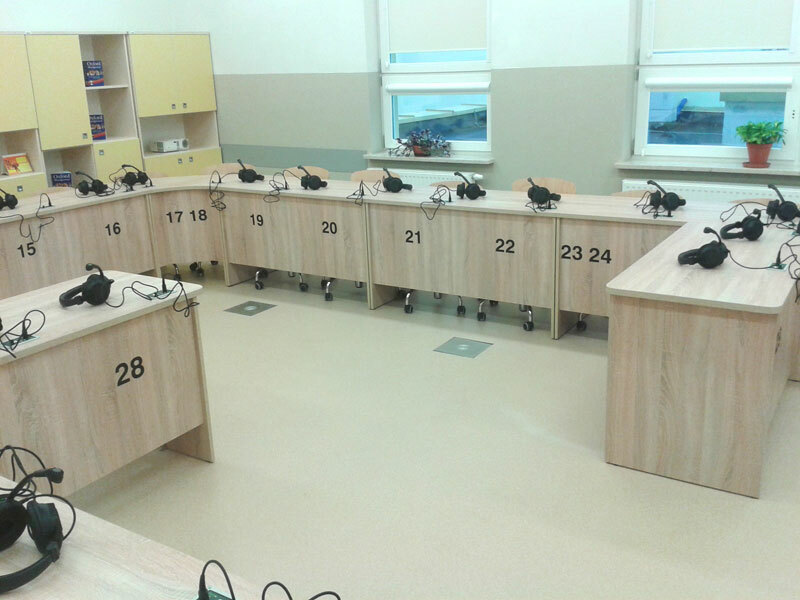 Teacher's recordings - a teacher can record any conversation of a pair or group of students. He or she can then replay the conversation and use it as a material to—for example—highlight a speech impediment and explain the rules of correcting such mistakes. 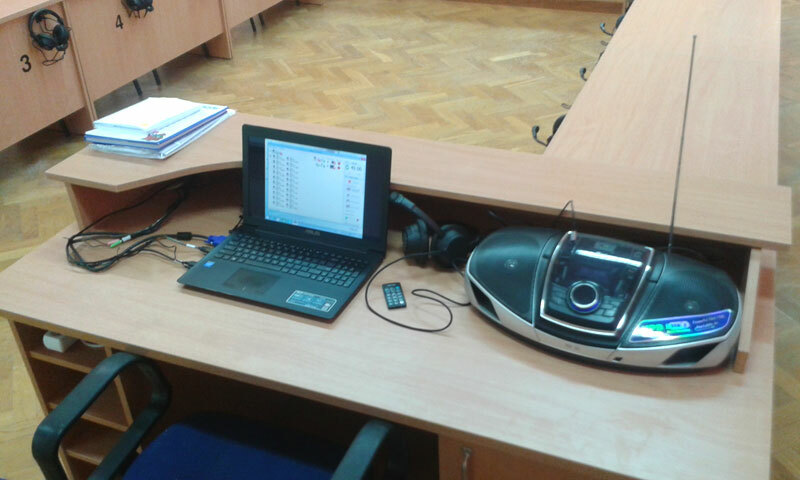 Recording equipment selection depends on a laboratory kind - CD/DVD recorders are common but you can also use an audio recorder, tape recorder or simply a personal computer. 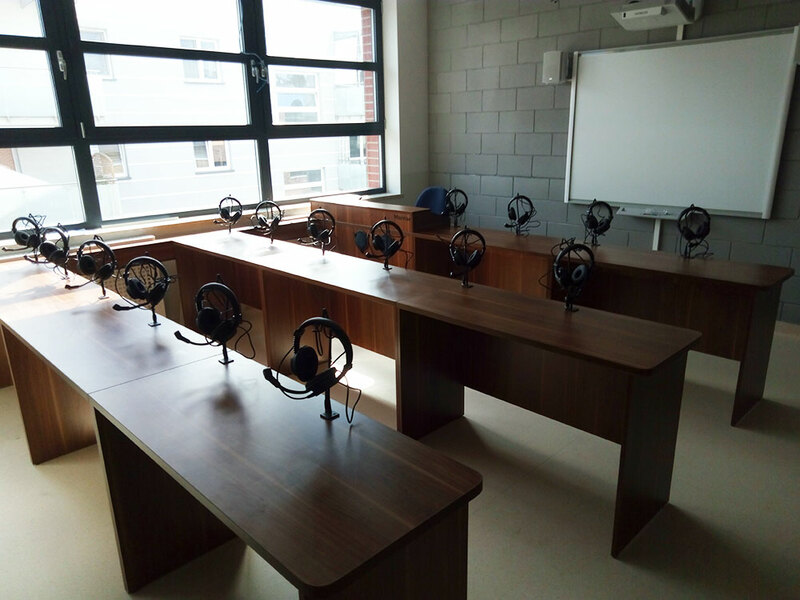 Individual recordings - a student can record his own talk, a dialogue he or she took part in or a group discussion he or she was part of. The record will contain an audio material which was talked over and can be used e.g. at home, as a revising material to train one's understanding of written and spoken language. 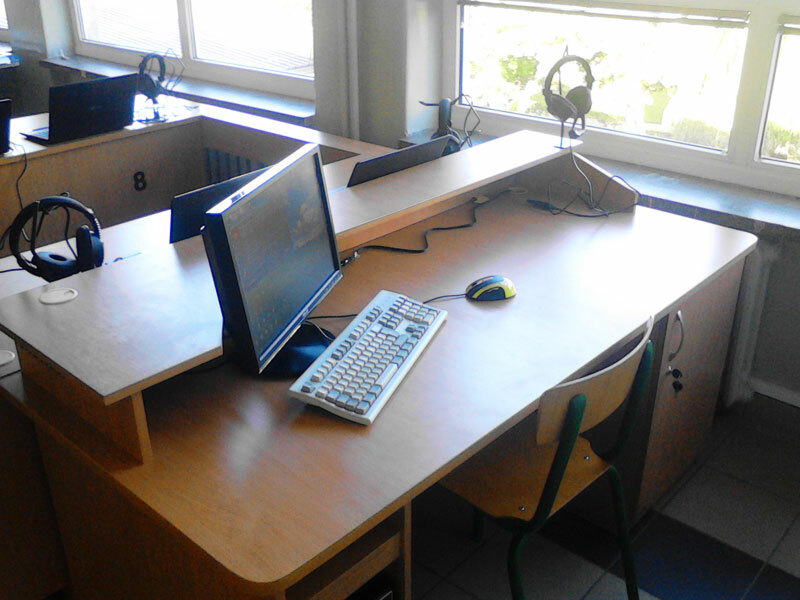 Depending on chosen equipment, a student can use an audio recorder or a PC. 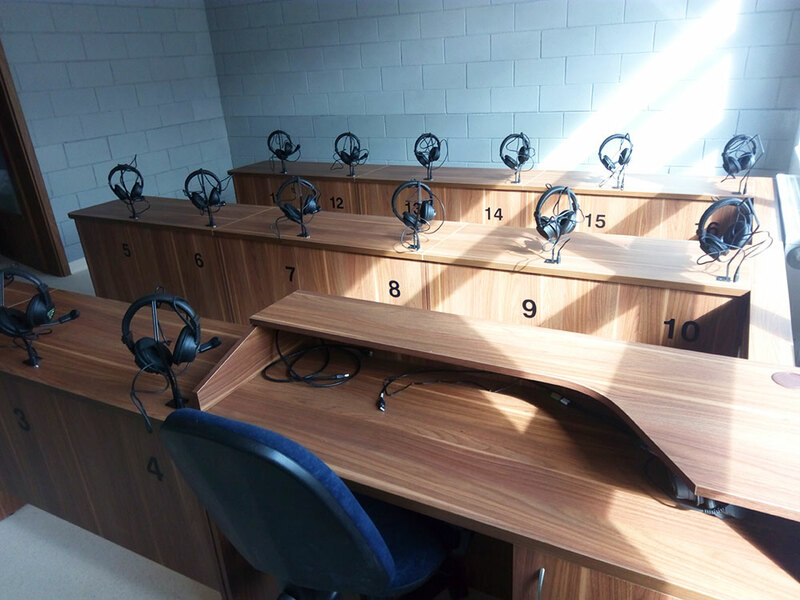 Pronunciation coach - the original sound and a student's voice are recorded separately as two audio tracks. 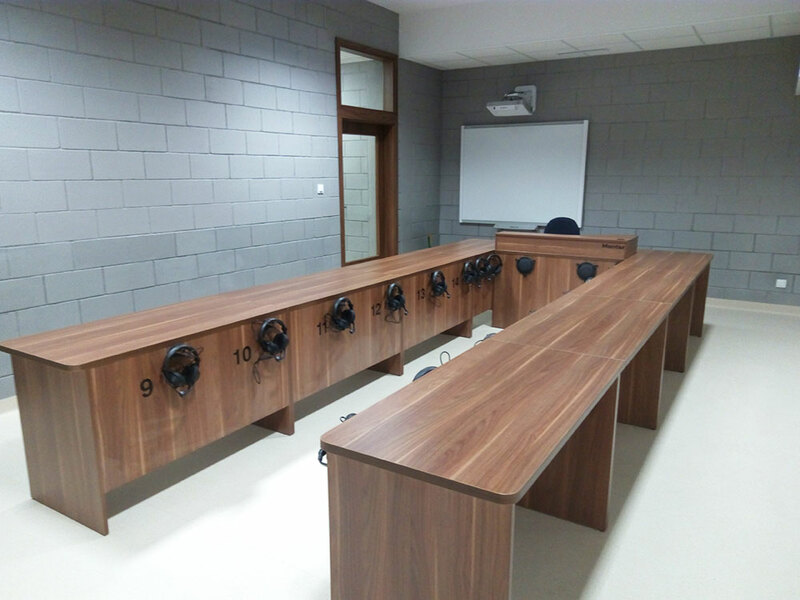 The student can compare his or her own voice to the original and analyse a graphic comparison of both records which clearly indicates the cause of possible aberration. Self-monitoring function. It's crucial to hear one's own voice while learning a proper pronunciation with a correct accent. 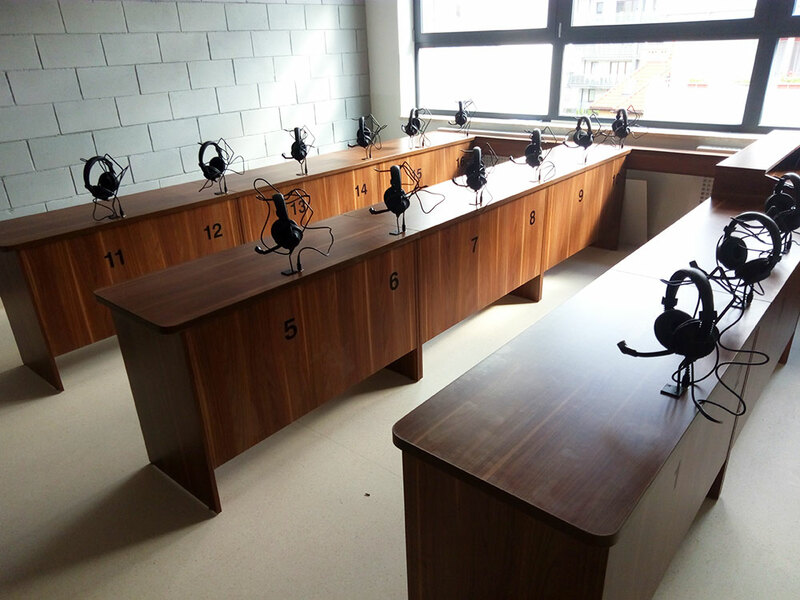 Language laboratory's headset tightly covers the ears and therefore causes the voice to be deafened and deformed significantly. 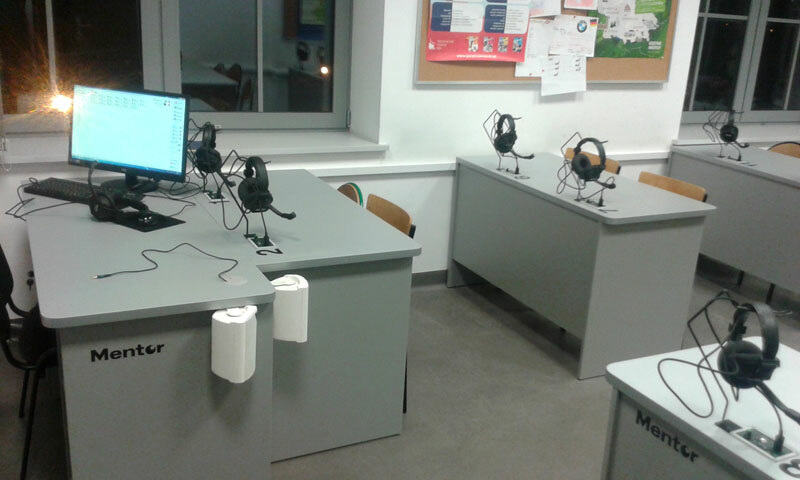 Use the self-monitoring feature to prevent that while learning phonetics. 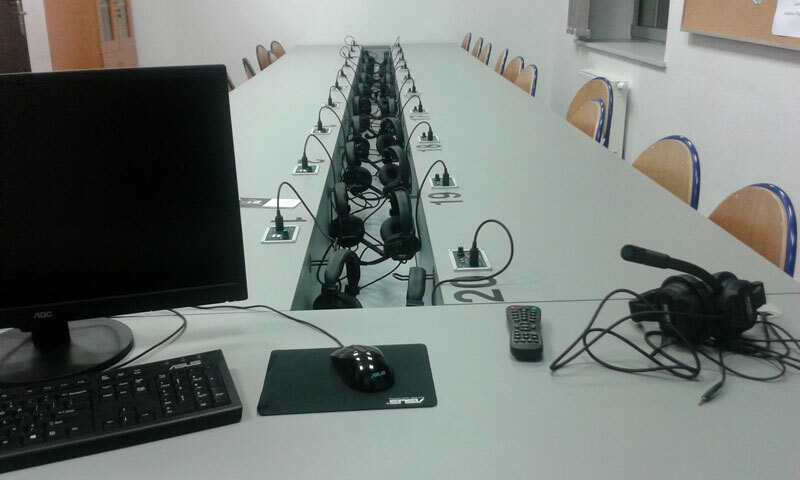 Na swej zawodowej drodze miałam okazję poznać wiele firm świadczących usługi na rzecz oświaty. Tylko kilka zasługuje na słowa najwyższego uznania. Według mnie i zespołu nauczycieli naszej szkoły na Takie wyróżnienie zasługuje Firma "Mentor". 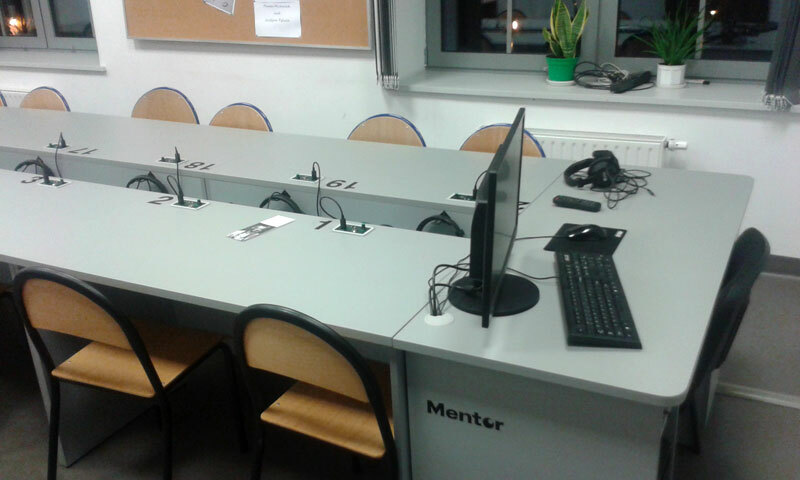 "Mentor" - to styl, klasa, najwyższa jakość, świetna współpraca i spełnianie marzeń klienta. 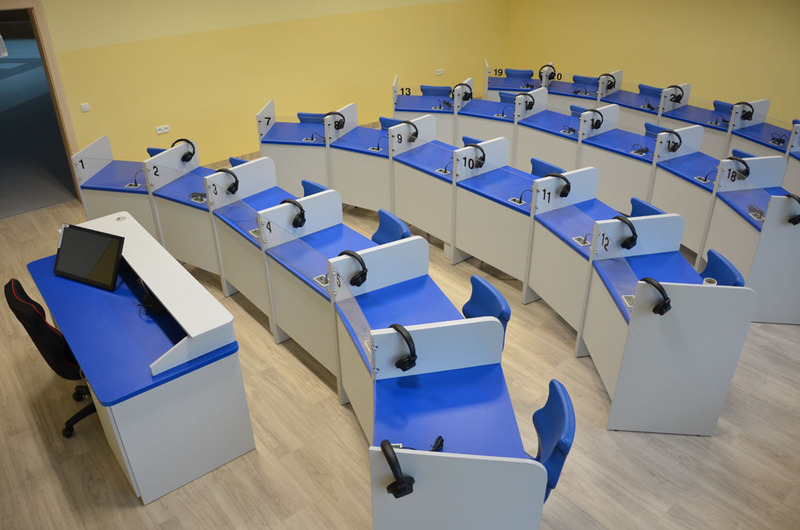 Jako dyrektor Szkoły Podstawowej im. W. Witosa w Bierkowie wraz z gronem nauczycielskim i całym zespołem pracowników podjęłam się odpowiedzialności za urządzenie wnętrz nowego skrzydła naszej rozbudowanej szkoły. Pracownia języków obcych powstała z marzeń. Jej realizacja przez Firmę "Mentor" jest tych marzeń odzwierciedleniem. 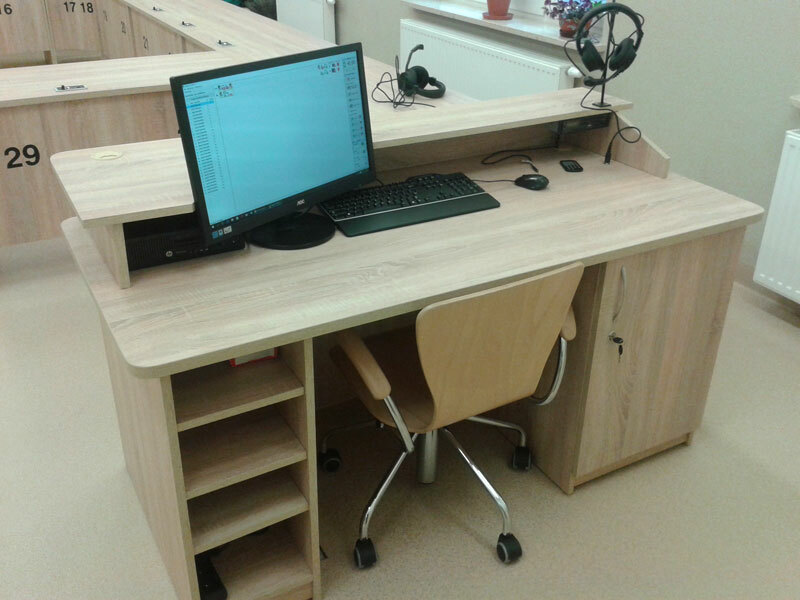 Nasza wizja ułożenia kabin w półokręgi, zestawienie kolorystyczne, wysokość kabin, forma krzeseł, wykonawstwo - wszystko razem jak z obrazka! 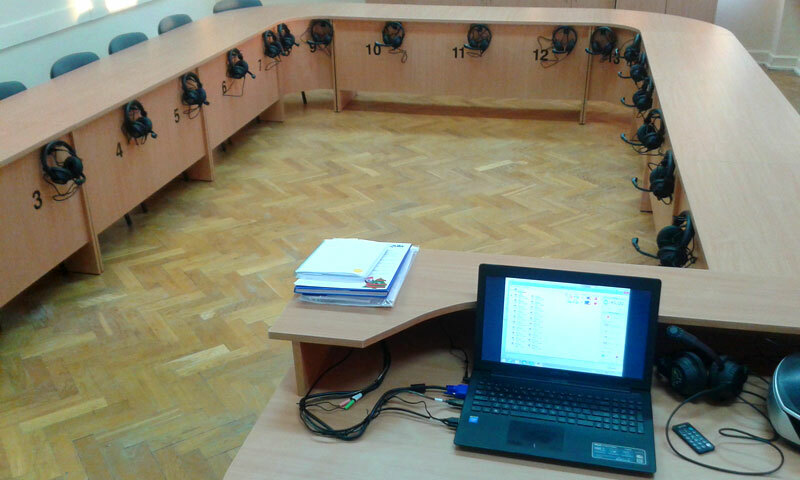 Radość dzieci i młodzieży na widok pracowni językowej jest największą nagrodą dla szkoły, dla mnie osobiście i na pewno dla Państwa Firmy.